When I’m out in public, I look at my watch a lot. It’s not because I’m nervous, or because I’m obsessed with the time. It’s because I’m checking on my neural networks. I can even view the log through the command-line, but I won’t bore you with a picture of that one. In the above example, sh-log executes go run *.go and echoes the standard output/error to a StatusHub server (which is configured via environment variables). The first argument to sh-log is the service name, which helps to distinguish between different jobs in the log. If you look back at the screenshots from the beginning of this post, the service names should stand out right away. 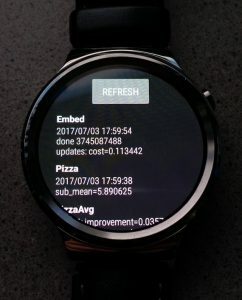 The simplest way to view a log is via the StatusHub web UI or through the Android Wear application. However, StatusHub also ships with some commands for reading and manipulating logs. As you can see, StatusHub allows you to be a command-line ninja with magical logging powers. Once you have basic building blocks like sh-log and sh-stream, the possibilities are boundless. With a pipe-based IRC client like ii, you can push chat logs to StatusHub in one terminal command. This makes it easy to keep tabs on IRC activity, even from devices without an IRC client (e.g. a smartwatch). An sh-server process running on some internet-accessible machine. All of your devices should be able to connect to this machine over HTTP/HTTPS, either through a reverse proxy or via port forwarding. 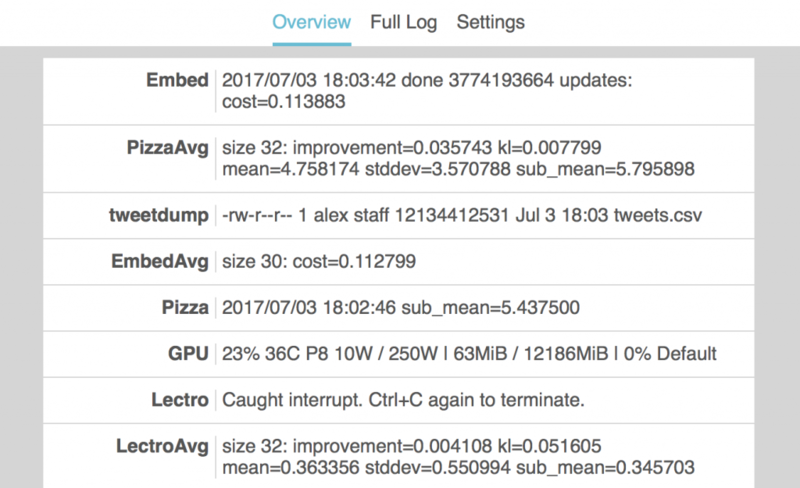 A set of jobs that do logging via the sh-log command. To have sh-log go to the correct server, you will need to set some environment variables. One or more devices from which you will consume logs. These devices simply need a browser, but you can also install the StatusHub commands and setup your environment variables accordingly.